FINLAND (WABC) -- YouTuber and New Yorker Casey Neistat gave up his daily vlog a few weeks ago, but he's still making viral videos and his latest is an amazing one featuring him being pulled and flown by a giant drone. Reminiscence of his snowboarding New York City's streets from last winter, Neistat and a team headed to Finland for a four day shoot to create an epic 360 holiday video. A massive drone took a team about a year to building, according to a behind the scenes video shot by Jesse Welle. It's so big that at least two people are needed to carry it. 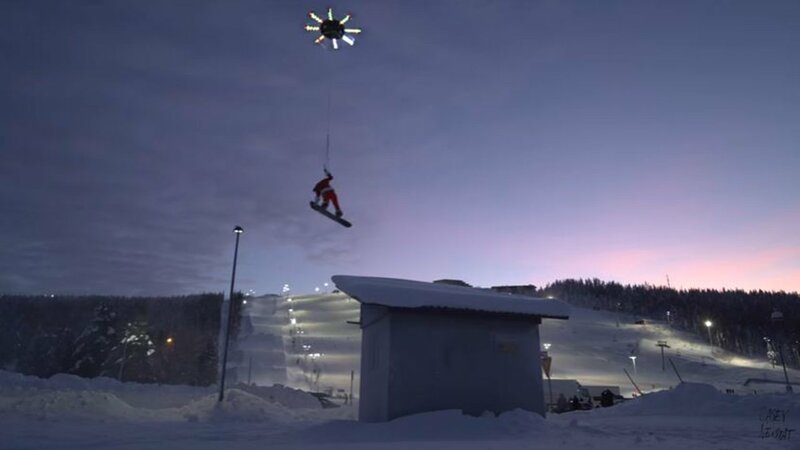 In the video, Neistat rides a snowboard pulled by the drone, which lifts him about 20 to 25 feet off the ground above rooftops and trees, and even up a ski slope. All this effort to create such an amazing 360 video was part of a promotion for Samsung. Droneboarding in 360 hit YouTube on Friday night. You can check out some of the 360 photos on Neistat's Facebook page. Multiple cameras were placed along the routes of Neistat's ride to capture it for his YouTube audience. The crews only had a few hours of daylight to shoot each day. Check out Welle's behind the scene video, which is also pretty epic.